Maybe it’s just from my summer months interning at a teen magazine, but this year I’ve been all about getting into the back-to-school spirit. Whether your in high school, college, or just a savvy fall shopper, it seems like fall is the time to re-vamp the wardrobe and indulge in some trendy essentials. Seriously though, what fun is a new school year without a new pair of jeans?! This makeup and accessories look is the latest result of the purple kick I’ve been on lately. I wanted this super opaque Lime Crime lilac lipstick for months before I finally ordered it online last year. Seems like it could be perfect to spice up my warm weather repertoire but found that, when applied straight to lips, the result was quite shocking! Recently, however, I had the idea of combining a different purple hue on the outer lip, then lightly blending it out. The finished effect is a cool ombre that I’m really diggin’ it this week. It’s still bright, but more wearable for those of us with less Lady Gaga-ish tendancies. I think I’m finally at a point in my life where I understand the healthy middle-ground in style. Much of my high school, and even college career has been made up of polar opposites. The difference between casual and dressy outfits meant wearing either yoga pants and T-shirts or sky-high going out heels and stuffy blazers. But working a full time job has helped me to truly understand the art of business casual done right. 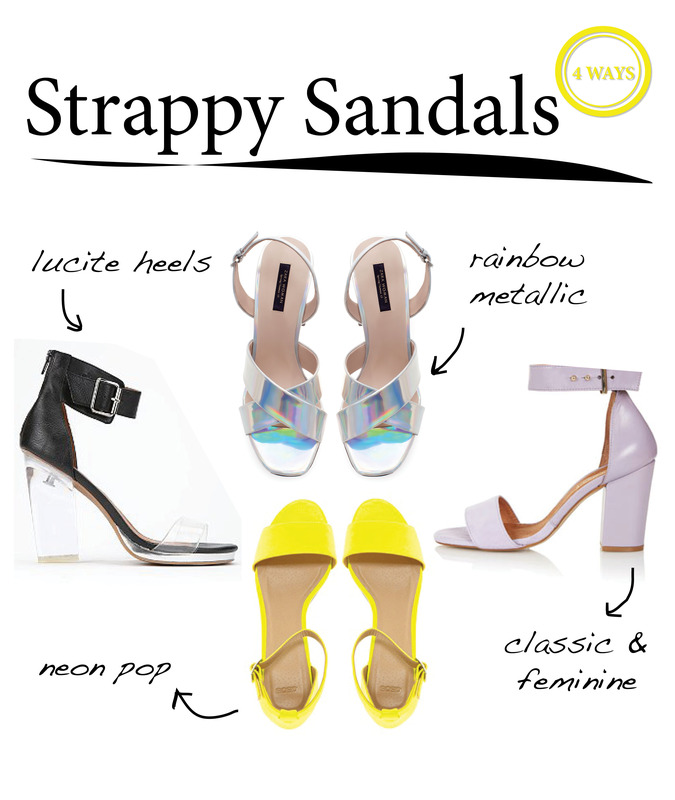 This summer, one of my favorite ways to add polish to a daytime look is with strappy heeled sandals. It seems that everyone I know is wearing this fun yet adaptable heel- and why not? They’re (relatively) comfy, and go with just about anything from summer shorts to sophisticated max dresses. The key is a classic shape, infused with trendy variations like lucite and bright colors. I’ve included here some of my favorite picks in stores now and was surprised by how reasonable it is to invest in the sandal craze. Which one would you wear? Guys, I think I’m in love. Fashion label Kate Spade is surely nothing new for fellow fashionistas; But I feel now, more than ever, that my dream life would be outfitted completely in the brand. Kate’s punchy, preppy, and colorful designs are as irresistible as candy- but with a sophisticated edge. I always make sure to start a long day of work with a hearty breakfast. Bananas & peanut butter, mini wheats, greek yogurt, etc. But this month I’ve been super into a new morning treat: Overnight Oats. Oatmeal is a delicious and healthy breakfast option, in my opinion, but not always palpable on hot summer mornings. This oatmeal recipe allows you to refrigerate the mixture overnight so you are left with a pre-made, delicious bowl of cold oats in the morning. And the best part- it keeps you full for SO LONG, so you can tackle the day with lasting energy! Living on the edge of Tibeca means a walkable distance to the Hudson. Sail boats, mini golf, lounge chairs, and telescopes on the dock… this local is perfect for watching a summer sunset and just screams JCrew when it comes to style! So when I found these slightly nautical looking polka dot pants at Forever 21 last week, I knew exactly where to wear them. But I think the preppy ensemble would be perfect for work as well. I love a good strong lip color, and the summer months are the perfect time to test out bright new shades. Some people tend to stray away from lipstick because it feels old, heavy, or outdated. Yet modern cosmetics have offered us some perfect solutions- lip stains, gloss balms, and everything in between! I’m currently loving this much-raved-about line from Revlon. The color I used here is Revlon Just Bitten Kissable balm stain in Smitten. It’s the perfect blue-toned pop of fuchsia for summer months. And I love the consistency of this product- a quick to apply lipstick and gloss all in one that stays on for ages!